CMLL Super Viernes is vastly approaching sports fans and starting tomorrow (or today if you’re reading on Friday) we are entering a period where things of importance will actually be occurring! Remember when those things used to happen on a CMLL Friday show? Pepperidge Farm remembers; alright we all do because it was only a few months ago but still. So what’s the big to do? The CMLL Universal Championship tournament, that’s what; after taking 2018 off CMLL is bringing one of their top competitions back. They’re also bringing us the debut of Atlantis Jr., the return of Kaho Kobayashi and a really good looking semi-main event too! This is a big show sports fans and thus it deserves a big preview from yours truly. So what are we waiting for? TO THE REVIEW MOBILE! Robin & Star Jr. vs. Akuma & Espanto Jr.
What to Expect: We’ve seen this horror story told many times before sports fans; three talented luchadores gather together for a promising opener, only for a mediocre luchador and CMLL’s restrictions to ruin it all. Get ready for that story to be told again, with just as many Canadian Destroyers as you remember. At least the opening scene with Akuma and Espanto riding out on the low rider bicycles will be fun. Winners: It’s Robin and Star Jr.; nice things don’t happen to them. Akuma and Espanto take this in three falls! What to Expect: KAHO KOBAYASHI IS BACK! Normally this would be the part where I make a snide remark about how CMLL is going to make that irrelevant, but I’m not going to do that because KAHO KOBAYASHI IS BACK! Winners: Dalys pins Kaho with a Swing Bottom in fall three to give the rudas the win, because there is no Grodd and the cage wasn’t 30 feet. What to Expect: This one of those “moment of truth; somebody’s life is about to change” matches given that Atlantis Jr. is smack dab in the middle of it all. This will be the youngster’s first Arena Mexico match under that name (hell I’m pretty sure it’s his first Arena Mexico match EVER) and I can assure you that this will be a match different animal than his Arena Guadalajara debut and even his New Japan debut. Those were no laughing matters but neither quite measures up to a luchador making his debut in THE lucha libre arena. The pressure will be immense and this match will frankly come down to how well Atlantis Jr. performs. We know what we’re getting from everyone else; both Roja and Mephisto will be on their game, Villano IV and Atlantis (especially Atlantis) will be turning the effort level up beyond normal and Hijo del Villano III will be…actually we don’t know what he’ll be because he’s still relatively new. Even still, all eyes will be on Atlantis Jr. He showed flashes of potential in New Japan that he can be something special in the years to come. Now it’s time to see if he can do the same in the biggest match of his life to date. Winners: Unless CMLL is serious about setting up Atlantis vs. Villano IV as a big match (and even if they are there’s still time to cross that bridge), this will end with Atlantis Jr. getting Hijo del Villano III up in La Atlantida to give him his first CMLL win. Now how many times will it take young Atlantis to get young Villano up in that move? That I cannot answer. What to Expect: Man, even after a year of Flyer doing main event things and touring FantasticaMania it’s so surreal to see Flyer up in this spot while Robin and Star Jr. are left loitering around in those lifeless CMLL openers. I still remember when Flyer and Robin were going to do a trios team with Magnus for crying out loud! I like to imagine Flyer walks by them in the locker room every once in awhile and it turns into that video of that guy screaming “I’M GONNA GET YOU OUTTA THERE! 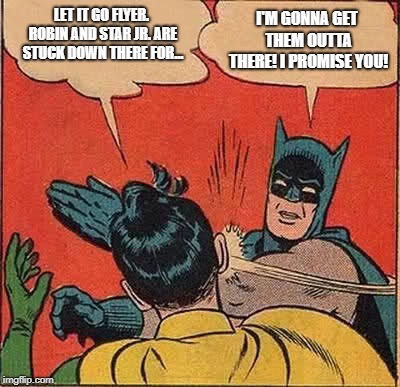 I PROMISE YOU!” And all Robin and Star Jr. can do is look on like this. Alright now it’s just getting depressing, and during the break down of a good looking match no less! This has everything to be great; a world class rudo team, two top stars in Mistico and Volador and a guy in Flyer who, despite his inconsistencies, will be in there with three guys he works well with (and one guy in Templario who he has great chemistry with). The only way I can’t see this match being good is if CMLL just gives all the time to the Universal tournament, makes this match ten minutes and Mistico and Volador enter Speed 2: Cruise Control mode. Otherwise this is easily going to be the best match on this show. Winners: Poor Flyer; he gets to be in these big matches but he also gets to be the fall guy. There is a 100% chance he’s taking a Guerrero Special in fall three to give the UG, Big Euf and Templario the W.
What to Expect: It’s time for the tournament to crown the only Universal Champion that matters. COME AT ME WWE STANS! Did I do the whole Reddit thing right there? Alright enough jokes; there’s probably newcomers out there asking what exactly is the CMLL Universal Championship? Is it a rip off of WWE’s belt? Actually you could argue it’s a reverse; the CMLL Universal Championship, around since 2009, is a nice red belt handed out to the champion of champions in CMLL. Every year (or almost every year) CMLL gathers 16 of their champions and splits them into blocks of eight, where the luchadores face off in a single elimination tournament. The winners of each block then face off in a final match to determine the Universal Champion. This year that will be decided two weeks from tomorrow, with Block B next week and Block A this week. And that sports fans is the tale of the CMLL Universal Championship. Actually there is more to it in that CMLL has 17 champions (18 if you count Eléctrico, although let’s be real; who actually does count Eléctrico?) this year, but we’ll cross that bridge next week for Block B. Block A is the usual featuring eight champions, all of whom are recognizable names in the CMLL hierarchy and all of whom are (at least in my opinion) are really, really good. The general problem with these Blocks is that, in order to keep the shows on time, CMLL keeps these singles matches short, limiting what the luchadores can do. That’ll be the bad news for tomorrow. The good news, as already pointed out, is that this is a talented field. The weakest members (Stuka, Terrible and Valiente) are still really solid on their worst day, while guys like Carístico, Forastero, Gran Guerrero and especially Dragón Lee and Cavernario are legitimately great. It’s very hard for me to believe, even with the limited time, that CMLL won’t be able to put together a good match or two within this block. There will be some talented luchadores next week as well but unless Diamante Azul is removed, this is the block that should produce the best matches of the tournament before the final. Winner: Let’s go through this process of elimination style. Forastero and Stuka have no chance; either guy winning would stun me more than the Dean Ambrose news this past week. Terrible and Valiente have both won this tournament before, but neither seems in line for a big push at the moment. Gran Guerrero is a good dark horse but no one sees him as a favorite. That leaves you with Carístico (white hot at the moment), Cavernario (off the best year of his career) and Dragón Lee (always a favorite in every competition he’s in) as the guys I see most likely to pull it out. In the end, I’m going to say Lee. For all I know his upcoming schedule (he’s rumored to be ROH bound) will prevent it, but from where I stand he’s the one guy of the three favorites due for a huge match and him vs. the UG or Volador Jr. feels like a final worthy of this tournament. So I’ll say Dragón Lee wins Block A by beating Cavernario in the finals. There you have it sports fans. See you tomorrow for a Live Review of this bad boy. TILL THEN! NextTons Of Talent Added To Expo Lucha August 17-18 In San Diego, CA – Icons, Legends and Superstars Head To SoCal!